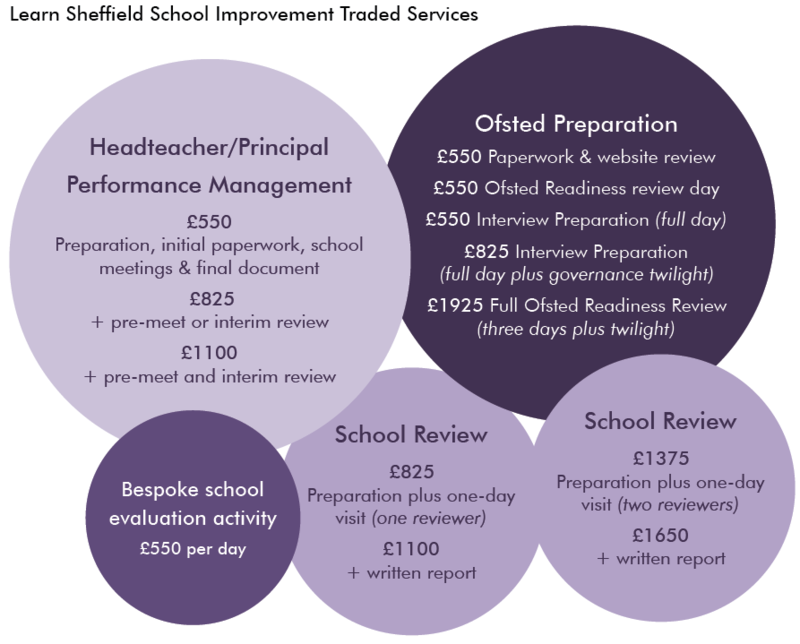 Learn Sheffield, through the menu of options below, is seeking to provide schools with a coherent and comprehensive range of review and evaluation activities. This supports schools in obtaining a quality assured and objective ‘external view’ to feed in to their self-evaluation and development planning process. All delivery of these activities will be quality assured and, where the school opts to have a written report, will provide independent evidence for the school to share internally and with OFSTED. We encourage schools to approach us to discuss the package that they need, or to work with other schools to access discounted prices. Whenever possible it is helpful to contact us well in advance, as this makes it easier for us to plan ahead for the deployment of our team or identify the right person to provide the service. It may well be that, when a school or group of schools is booking multiple activities, we can seek to provide continuity of judgement so that wider conclusions and patterns can be identified. Learn Sheffield also offers a free follow up meeting to support schools, when they request it, to identify the right partners to work with in order to address any actions that arise from the review/ evaluation. We believe that Learn Sheffield has the ability to have an overview of the options available, to support schools in navigating the variety of options to choose partners who are quality assured. If you would like to organise one or more of the review and evaluation activities above the first step is to contact Learn Sheffield in one of the ways below. The team will then be in touch to discuss your exact requirements and the different ways it could be approached, to ensure that the activity meets your needs. We welcome enquiries from any school or group of schools about any activity or group of activities. The cost of any options offered to the school(s) will be agreed prior to booking. The cost of the booking will be determined by the final scope of the activity (including preparation and report writing time if applicable). Please note that whenever a review and evaluation activity is requested by Learn Sheffield or arises from school profiling or categorisation, this will not be subject to charges.